Incarceration plays a substantial role in the lives of many families in the state of Texas. Statistics report that 143,000 individuals are currently incarcerated in the Texas Department of Criminal Justice system. There are many uniques issues and concerns that arise when one parent is sentenced to incarceration, including child custody, visitation, and in many cases, issues of child support. Because child support is treated as a particularly important issue by courts systems in the state of Texas, parents who are currently incarcerated or face incarceration in the future should understand some of the key elements about paying child support. Child support orders are issued by courts in the state of Texas and require a non-custodial parent to make payments to a custodial parent. These payments are intended to help provide for the care and nurture of an involved child or children. These support orders require a non-custodial parent who is incarcerated to continue making payments. Because child support orders even extend to situations where a parent is incarcerated, parents who fail to make payments in these situations can end up facing additional penalties. 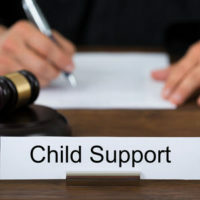 To obtain modification of an existing child support order, an incarcerated parent must file the proper request called an Incarcerated Noncustodial Parent Affidavit of Income Assets with the appropriate Texas court. Incarcerated individuals are also often required to submit information regarding the noncustodial parent’s income and assets. A skilled family law lawyer can prove particularly helpful when incarcerated individuals seek to obtain modification of a child support order. When these types of hearings occur, the custodial parent frequently appears to contest modification of the existing order. During this hearing, the court will determine whether the non-custodial parent’s incarceration constitutes a “substantial change in circumstance”. Unless a modification is granted, the incarcerated parent will be required to pay the amount of support that was initially ordered by the court. When a child’s custodial parent is incarcerated, that parent can have support payments directed to the individual who is responsible for raising the child. In order for these support payments to be directed, individuals frequently must sign an Authorization for Release of Information and Payment, which allows the person who is looking after the child to receive these support payments. Without properly authorizing these payments to be directed to another individual, payment will continue to be made in the manner ordered by the court. Special note should be made of non-custodial parents who owe significant amounts of back child support, which can also result in non-custodial parents being incarcerated. If you or a former spouse is currently or will be incarcerated and you have issues concerning child support, child custody, or visitation, you likely need the assistance of an experienced lawyer. At Lindamood & Robinson, P.C in Houston, we understand the challenges that incarceration can present in relationship to family law issues. Contact us today to make sure to make sure that these issues result in a positive outcome.